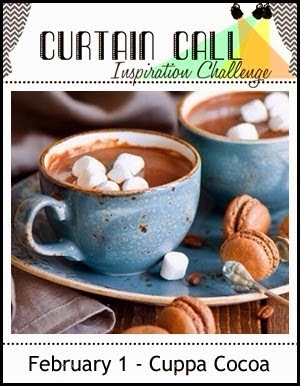 I made this card for the current Curtain Call Challenge called Cuppa Cocoa. I was inspired by the colors in the photo and the marshmallows! All the stamps are from Mama Elephant. I made the background by blending Stormy Sky and Faded Jeans Distress Inks and colored the cup with Frayed Burlap and Brushed Corduroy Distress Markers. I colored the doily with Antique Linen Distress Marker. The grid is just a fun embellishment I had in my stash. The ink is Dark Chocolate from Papertrey Ink. The "marshmallows" are little pompoms from Hobby Lobby. 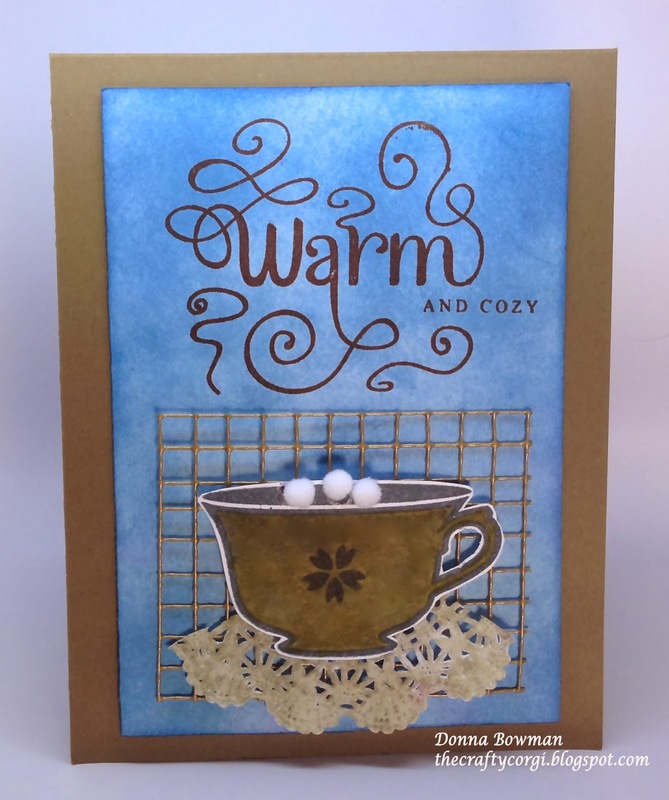 It was nice to make this "Warm and Cozy" card on a cold winters day. Thanks for stopping by! warming my heart with this one, Donna! Donna, what a great card! Love your use of the distress inks and the Poms? genius! Really cute Donna! I love the colors and background. FYI... Dusty's pictures just kept looking at me and now I finally have my own little (ok, she's actually big) Corgi. She has a cattle dog mix (heeler?) and is a bigger than most at 37 lbs. Thanks Dusty, for helping me find Freckles. So glad you found Freckles. Can't wait to her!! Corgi's (and corgi-mixes) are the best!! Saw this on FB, and fell in love! It's adorable, Donna, and those puffy 'marshmallows' are super.